Helps slough off dead cells on the surface of the skin of dry, dull or rough areas of the body, leaving the skin smoother and healthy-looking. For elbows, knees, legs, heels, feet and back of upper arms. Formulated with glycolic acid (the AHA of choice), in an Amphoteric System™. This patented controlled release technology slows the release of glycolic acid. The potential irritation of an AHA formula is primarily due to the rapid penetration of AHA free acid molecules into the skin. By controlling the release of the glycolic acid, the skin will tolerate a higher concentration, resulting in a faster exfoliation. It will help slough off dead surface skin cells on dry, dull or rough areas of the body such as elbows, knees, legs, heels, feet and back of upper arms. Regular use will help remove dry layers of skin and calluses, prevent ingrown hairs on the legs and remove keratosis pilaris on the arms, leaving the skin smoother and healthy-looking. A highly effective natural exfoliant that removes the build-up of dead skin cells on the surface of the skin. To be used by or under physician supervision. 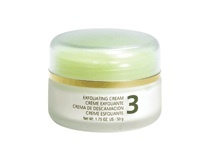 Apply to the affected areas such as: elbows, knees, legs, heels, feet and back of upper arms. If applicable, use sunscreen prior to sun exposure. First time users should build skin tolerance gradually by using every second or third day for the first two weeks. After this period, use product progressively. Apply a thin layer to the affected areas and massage into skin. If applicable, use sunscreen prior to sun exposure; wait 10 to 15 minutes after applying the sunscreen to apply the Exfoliating cream. After you build a skin tolerance, product can be used once to twice daily. Glycolic Acid, Aqua, Arginine, Aqua, Glyceryl Stearate, PEG-100 Stearate, Triethanolamine, Caprylic/Capric Triglyceride, Stearic Acid, Isostearic Acid, Cetyl Alcohol, Ammonium Hydroxide, Magnesium Aluminium Silicate, Dimethicone, Cholesterol, Isopropyl Palmitate, Phenoxyethanol, Sorbitan Stearate, Hydroxyethylcellulose, Xanthan Gum, Stearamidopropyl Dimethylamine, Disodium EDTA, BHT.